The Hotel Barbara is located in the Raval district, one of the oldest and most picturesque districts ofBarcelona. 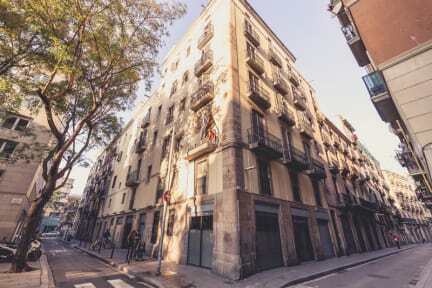 Staying at the Raval you can feel the ethnic and multicultural mix of the city. We have a vast experience in the hospitality sector and a great knowledge of the city, capitalizing both elements to offer a great experience to our guests and travellers. Located in the picturesque Raval district, the hotel is situated at just 400 metros from Drassanes or Parallel metro stations, just 300 metros from las Rambla and less than 10 minutes from La Boqueria or the harbor. Because of these and many other reasons, Hotel Barbara is a strategic establishment to visit Barcelona. Cozy, marvellous and comfortable, this is the perfect room for travelers. They are equipped with: Free WiFi with high speed connection, TV, air conditioning, etc. The standard room is equipped with two beds. In addition, we have some common areas where the guests can relax and enjoy the best of our facilities and the company of other guests and travellers. Breakfast time from 2 November is from 7am to 10pm.